Just a week ago the temperatures hit 90 degrees with the humidity numbers right up there, too. This is typical for July in Ohio. Rich put out the tub of cool water in the girl's pasture and they immediately jockeyed for position to be the first to take a dip. Leezza won the rights to the first dip, and stepped her front quarters into the tub. But our old mama Took soon let Leezza know that age comes before youth. Leezza quickly ceded her place to Took. Mango, in an advanced stage of pregnancy, was content to lay in the mud puddle outside the tub. Then on the very hottest day, my friend Rosalie brought her two darling granddaughters out for a farm visit. They came out in the evening after dinner in the hope that it would be a bit cooler. Not so much. Even so, the alpacas put on a good show for the girls. Our little "boys," Asterius and Brutus rarely disappoint our visitors because their curiosity overrides their innate timidity. Once the boys realized that these charming children held out handfuls of sweet feed the alpacas threw out all caution. Rosalie was also delighted when Brutus and Asterius realized that she had the container of sweet feed and they decided to be her best friend, too. Ultimately both of the human kids earned the trust of the alpaca kids and were rewarded with "kisses." As their visit came to an end I suggested that they visit our local soft serve ice cream place to cool off. I warned them that, unless they have a voracious appetite for ice cream, they should order a small cone. Bloomville for Ice Cream as this little place is called, is known for their giant servings which often surprise the unsuspecting newbie. 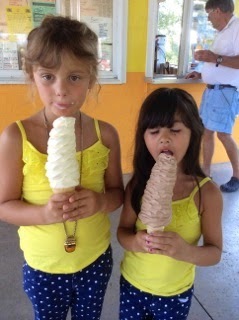 Later, Rosalie sent me this picture of the girls with their medium sized cones. Almost as big as the girls themselves! In an earlier post when the strawberries were ripe and I was making jam, I mentioned that my jammin' partner, Olivia, was traveling in Europe this year and would miss the season. Fortunately, I had the presence of mind to freeze several quarts of berries for use at a later date. When Olivia returned I got a text from her wanting to know when we could make jam. The following weekend she came up to stay and we made a batch of strawberry jam and another of raspberry. All is right with the world and g-ma is happy when she makes jam with Olivia. Remember when I said that the temperatures for Rosalie's farm visit topped off in the low 90s? Well, that was the last really hot day. The very next day a cold front went through and the temps dropped to the 70s. This morning when I got up the thermometer reading was 50 degrees! In July! Normally the hottest month of the year in these parts. The skies are blue and there's a gentle breeze. Perfect weather for a heat intolerant person like me. Also perfect weather for jam making, and that's what I did. I made a batch of the best blueberry jam in the world, if I do say so myself. And now, I think I'll treat myself to a piece of toast with warm blueberry jam. With the temperatures in the high 80s and the humidity levels right up there with the temperatures, Rich and I decided that it was time to break out the sprinkler and the wading pool. Usually the pool is for Callie, the dog, but this year, since she spends most of her time inside with me on super hot days, we transferred it to the pasture with the little boys, Asterius and Brutus. Since they were born in the fall last year they had not experienced the pasture "water park" features and it took them quite a while before they put their tootsies into the water. They spend several hours poking their noses into the sparkling, cool water. They were using it as a giant water bowl! Though we sat out on the deck for a while watching them, they never dipped their feet in. They must have eventually discovered what to do because this morning the water level was down by half; there was dirt in the bottom; and there were little foot prints in the mud around the outside of the pool! Nikko got the sprinkler on his side of the fence first. As soon as Rich turned it on, Nikko had his nose in the spout of water, checking it out. He pawed at the hose and sprinkler for a bit. At one point, he even flipped it over. Rich righted the sprinkler and Nikko quickly figured out that the water was very refreshing. He "bellied up" to the sprinkler and kushed down with his chest right over it. Callie, who had been sniffing around the pasture while Rich checked out the hay situation, hustled up to Nikko and stood there, nose to nose, both animals checking each other out. Luckily I had the camera ready because this sort of situation doesn't last long. Callie cannot resist the urge to either bark or jump at the alpacas which sends them flying across the pasture. After just a few seconds of this, Callie lunged slightly and that was enough to send Nikko to the other side of the pasture until I ordered Callie out! Neither Callie nor the alpacas seem to be afraid of each other so I think that this has become some sort of game for them. Rich switched the sprinkler to the girls side of the pasture to give them a turn in the water before we had to turn it off for the evening. Right away, Mango, who is pretty far along in her pregnancy, settled down over the sprinkler forcing her mama, Took, and her bff, Leezza, to watch on. When Mango had cooled off sufficiently Took hovered around the sprinkler cooling off her feet. Took prefers to splash in the puddles that accumulate near the sprinkler than to lay down in it. Leezza's turn was last. She splashed in the puddles, put her face in the fountain of water and then just stood cooling her toes off in the mud.